Are debts shared in the case of a divorce? It’s a natural question often asked when people are thinking of separating or are actually going through the separation process and heading for divorce. 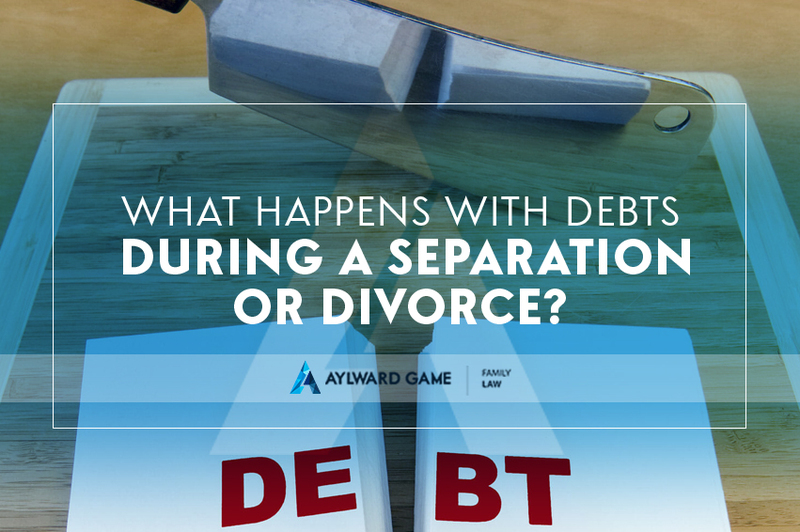 What happens to debts during separation or divorce? Whether debts are shared can depend on a number of factors, but generally speaking, any accrued debt is the responsibility of both partners, just as the sharing of assets is. One of the first steps in determining what each separating party is entitled to is to add up the assets and subtract the total debt. This will leave the net asset amount (or liability if the net amount is negative due to debts exceeding assets). While it’s generally assumed in the beginning that debts incurred during the course of the relationship were for the mutual benefit of both partners, in some circumstances it can be proven that a particular debt was for the sole benefit of one party, and therefore the liability of that debt is their sole responsibility. Something like a gambling debt would be considered an accrued debt solely in the interest and benefit of the partner that created the debt. There is also the situation where a couple are in the process of separating, but are not yet officially divorced. What happens to any debt accrued during this phase? What if one partner raids the joint bank account, or racks up a pile of fresh debt on the joint credit card? In this case the courts will look at the actual timeline of when the debt was created and will take this into serious consideration throughout the settlement process. The exception to this would be if a mutual debt was accrued post separation that benefitted both parties. A mutually beneficial debt will likely be included in the final asset pool. Divorce settlements can often be a very emotional and confusing process, so to approach the situation with a clear mind and to understand how everything works and what your rights are, then it’s best to discuss the settlement process with your lawyer. Aylward Game Solicitors are your local family law experts in the Brisbane area. Make an appointment to talk with one of our specialists about your situation. We’ll put your mind at ease and help negotiate the very best outcome for your asset settlement.